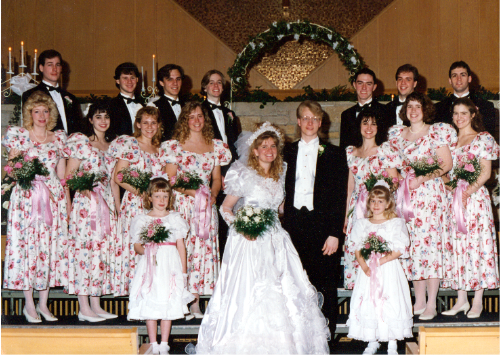 If you were young like we were when we were when we got married 15 years ago (tomorrow), you remember what it was like to have lots and lots of friends. College friends, church friends, high school friends, siblings, etc. We had a very large wedding party. I was looking at this photo today and wondering about these friends. Four of them I have hardly spoken to since the wedding. Our lives separated. We took our own unique paths. Life was good with them for a while. I loved them dearly. It’s amazing to see where God has taken these individuals and their families. Some chose to keep following Jesus, some didn’t. Some followed Him to the Ends of the Earth. Some serve Him by unique means in their homes and jobs. I am so proud to have known and loved these friends. Congratulations on 15 years!!! I am so wearing that dress tomorrow in honor of you guys. Congratulations! Has it been 15 years already? I feel old! Congrats on the 15 years. I really enjoy these photos you put on here. This picture of Lorimer’s sanctuary brings back many fond childhood memories. WOW ! Those dresses are….. wow, I am speechless! Great Picture, makes me think about those special people from our wedding party.